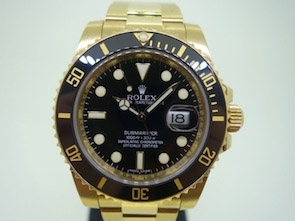 Gent’s Rolex Submariner in 18ct yellow gold. Black dial with applied luminous markers and date at 3. Automatic 3135. 40mm case with sapphire crystal, screw down Trip-Lock crown and rotating divers bezel with black ceramic insert. It can be argued that the most iconic watches were borne by necessity and practicality and the Jaeger-LeCoultre Reverso is no exception. Developed by Jaques-David LeCoultre with engineer René-Alfred Chauvot for Polo players who demanded a wrist watch that could withstand the physical nature of the sport. The ingenious design protected the dial, hands and glass by using pins, grooves and a locking mechanism to slide the watch out of it’s frame and turn around to reveal the reverse metal caseback. Since LeCoultre patented this design in 1931 there have been many iterations produced but our focus today is on the Reverso Repetition Minutes introduced in the mid 1990’s. Watches that sound the time have long been a speciality of Jaeger-LeCoultre. These include repeaters which strike on demand the hours, the quarters and, since the 19th century, the minutes as well. The time is repeated in sound by hammers striking steel gongs when one slides a bolt along the case - a facility originally designed to tell the time in the dark. 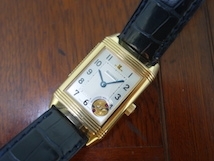 Jaeger-LeCoultre registered a number of patents in its development of the repeater until technological advances allowed the complex mechanism to be reduced to wrist watch size. The manufacturers, watchmakers and technicians had to muster all their skills and ingenuity to create a minute-repeater in a rectangular calibre. They developed an entirely new repeating movement. The Calibre 943 comprised of 306 parts, finished and adjusted together by hand. Goldsmiths and designers combined their talents to create the 18-carat pink-gold case with the ribbed bolt to arm and release the repeating mechanism. An aperture in the silver, engine turned dial reveals the spinning governor of gold, blued screws and rubies that keeps the strike as regular as a metronome. A limited production run of 500 were created in the mid 1990’s priced then at $98,000 AUD which was comparatively less than other Swiss rivals for such a complication. I procured this wrist watch seven years ago from a good customer of our Brisbane store after I traded my Patek Philippe 5056P, a lovely moon phase platinum wrist watch but the allure of a minute repeater complication and the classic art deco style was too much to resist. This wrist watch sits very comfortably on the wrist and activating the repeater with the bolt is straightforward in operation. The strikes are tonally pleasant and loud enough to hear in a relatively noisy environment. Since ownership this watch has been mechanically faultless and accurate in its timekeeping. This particular example did not come with box or papers but that does not detract from the ownership experience of this great iconic model with a discreet complication within. Dial: Silver, engine turned with Arabic markers and blued steel sword hands with cut away governor display. The Seiko diver story starts with the 1964 Tokyo Olympics. This event marked the re-emergence of Japan as a modern nation on the world stage. In 1960 Seiko was selected to be the official timer of the games and was tasked with creating a range of timing devices for various events. Out of this push came among other things the touch pad system in swimming pools, the quartz chronometer and the dot matrix printer. Seiko also introduced a range of new watches including the World Timer and their first wrist chronograph. Another model that makes its appearance during this time is the Seiko Sportsmatic SilverWave in 50 and 30 metre water resistant models. This is really the start of the Seiko Diver story. This was the first watch made by Seiko with an inner rotating bezel and features the debut of the Tsunami wave caseback emblem still used on divers today. These were in production for around 3 years with the 50 metre version with screwdown caseback being first followed by the press fit case back 30 metre version. The next major model and one that most people are familiar with today is the 6217-8000 or 62Mas. This is the first Seiko diver with a 150 metre water resistance rating. 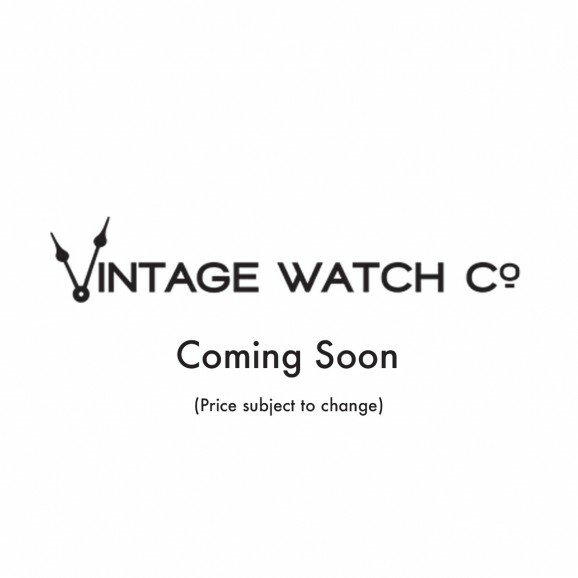 There are two versions of this watch, an early small crown version that was only made for a few months in 1965 and the more common big crown version. It is this big crown version on which the new SLA017 limited edition re-issue is based. In common with most divers of the era this watch features a domed plexi glass and a low beat movement ticking at 18000 bph. A not so common feature for the era is the inclusion of a date function with quickset. This watch was used by the 8th Antarctic Wintering Team, a group of Japanese scientists in 1966. With introduction and success of this model Seiko continued to research and develop greater water resistance in their divers culminating in the introduction in 1967 of their first 300 metre professional model the 6215-8000. This model introduced to the range the Hardlex crystal and a screwdown crown to give the greater water resistance rating. This watch marks the begin of the two level model line in divers, the 150 metre watches for recreational diving and the higher rated professional models. Just one year later Seiko introduced the second professional model the 6159-7000 which built on the success of the 6215 by introducing a hi-beat 36000 bph movement from the Grand Seiko line. Its interesting to compare this watch with the equivalent Rolex Submariner of this era the 1680 with its low beat movement, plexi glass and non-quickset date. These two models are the inspiration for the current Marine Master 300. 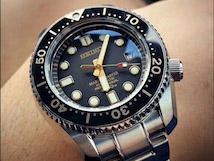 Meanwhile the next generation of Seiko recreational divers was released in 1968. The 6105-8000 introduced a new generation of calibre beating at 21600 bph and adopted some of the innovations of the professional line including the Hardlex crystal. This is the first version with the c-case shape. The next version of this watch is the 6105-8110 or the Captain Willard - so called because it is the model that Martin Sheen wears in Apocalypse Now. The 6105 introduces the cushion case shape that is still seen today in the modern SRP line of Turtles. This watch has really gone up in price in collectors circles with good examples going for as much as $2000 these days. Both models were produced side by side for a few years but the 6105-8000 disappears in around 1971 while the 6105-8110 continues till around 1976. Also at this time there was a major change to the professional line of watches. Legend has it that in 1969 or 1970 Seiko received a letter from a commercial diver in Kure City in Hiroshima prefecture about some problems he had experienced using the 300 metre divers. He was a saturation diver and found (as Rolex did) that in helium rich environments the crystal was popping out of the watch on decompression. Also he found the watches to be vulnerable to damage when knocked against rocks underwater. Seiko took this letter as a challenge to do better and after 5 years of research and development introduced the 6159-7010 or Tuna. This was Seikos first 600 metre diver and the first titanium divers watch. It also introduced the special L shaped gasket designed to stop helium entering the case in saturation dive conditions and thus avoiding a special helium escape valve. 1976 sees the introduction of a new reference and movement to the recreational dive line. The JDM 6306-7000 and for the rest of the world the 6309-7040. This is the watch that the current Seiko Turtle diver is modelled after. The 6306 movement is a hacking version of the 6309 and as it was JDM the day wheel is in Kanji. Other than that the two models are identical. This is an extremely robust model and with a little work examples can still be easily restored to diving condition today. As with the 6105 the 6309 Turtle also makes appearances in movies most notably on the wrist of Ed Harris in the Abyss. Mick Jagger was also a fan. The 6309 and 6306 were the last references to be made entirely in Japan. From around 1981 the movements and dials were made in Japan but cased in Hong Kong. Production of the 6306 ends in around 1979 and the 6309 winds up in about 1985. Most people know Seiko as a producer of quartz watches and towards the end of the 1970s they introduced the their first quartz diver, the 7548 reference in black dial and bezel and also a Pepsi variant. The case shape of this one will look familiar to most people as the same as the SKX007 and it is in fact the inspiration for that model. The case was also used on a slim case version of the 6309 mechanical series. There was also a number of quartz variations of the Tuna introduced in the late 70s including the first 1000metre version.